@Bubba: Actually that is a common misconception; the expression is in fact “just deserts”. While a desert is a “hot, dry, and sandy place”, it also means something like “deserve”, which is actually where the word deserve derived from (desert). You can read more about that here. According to the OED, this is false. 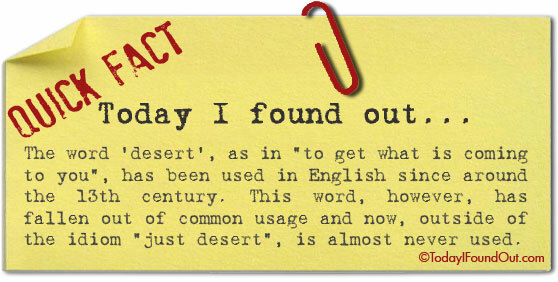 The one’s whose etymology you speak of is from Old French “deservir”, the other’s is from Latin “desertare”/”desertus” (as in the noun desert). Latin, as you know, is older than French.